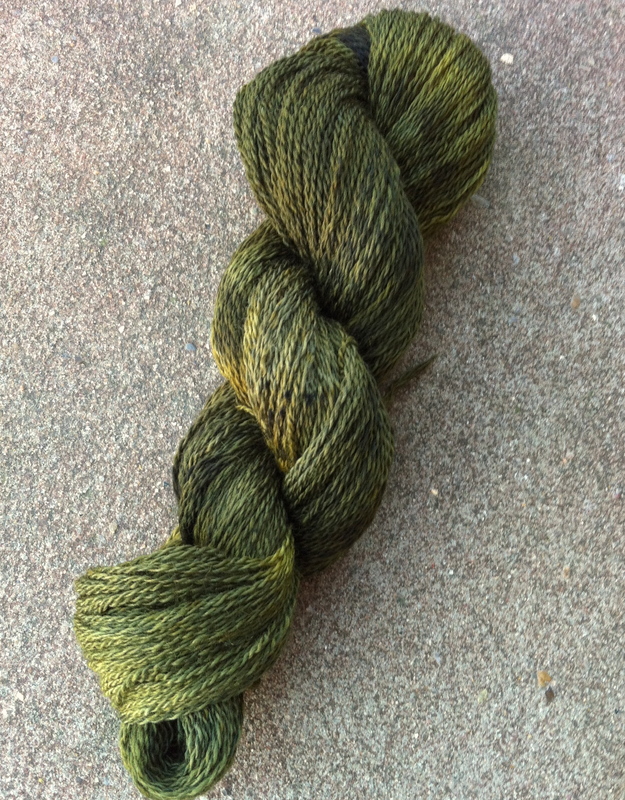 I have composed and dyed 3 new colors: 2 greens and a red-brown. 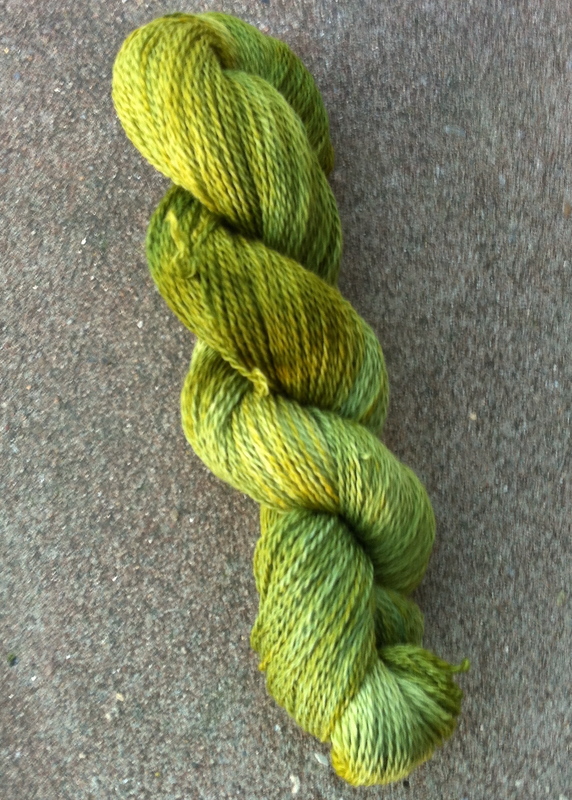 Here they are, shown on Opus yarn. 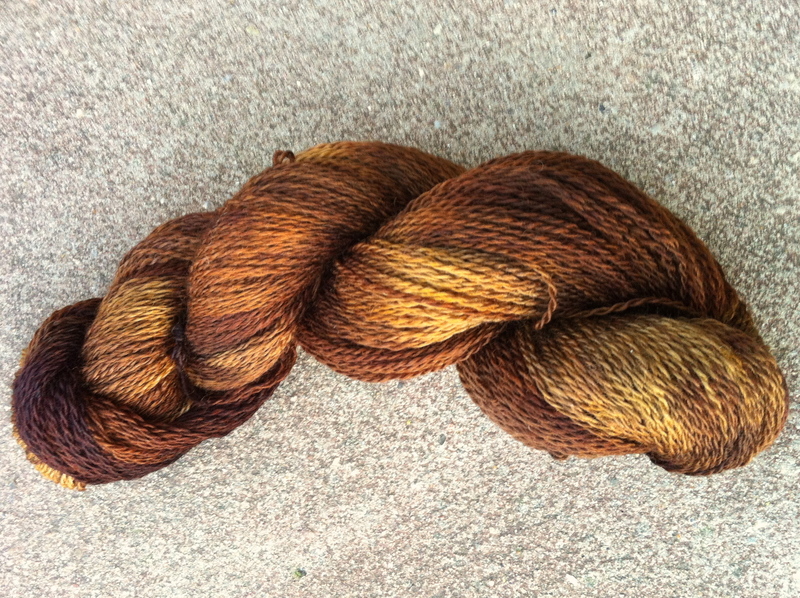 The chestnut brown have been dyed on wool-tops as well as the Opus yarn, but I don’t have any photos of the Chestnut fiber to show yet. Also, the rug weaving project I talked about in the last post is coming along nicely. I’m about 20 cms short of finishing the first one, and right now I am thinking about how I want the second rug to look. The exact plans are not quite complete yet, but #2 of this warp will be a much more colorfull rug than #1, that’s for sure! 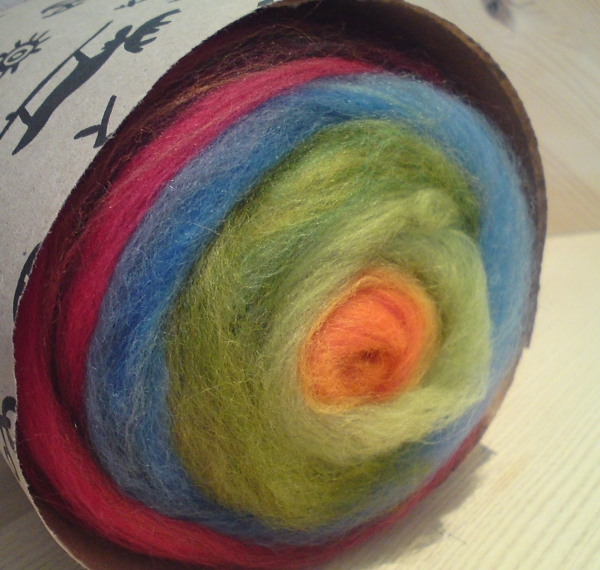 I want to try weaving with several weft-bundles per pick, so that I can change colors in the middle of the rug. I have a feeling it will be slow-going, also because I will be composing the weft bundles out of many strands of yarn each. What fun it will be! 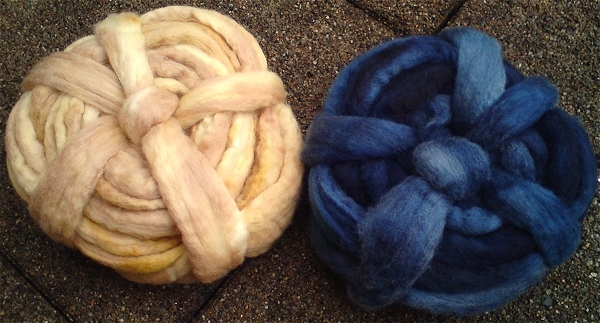 “Creme” and “Sailor”, both shown on shetland wool. 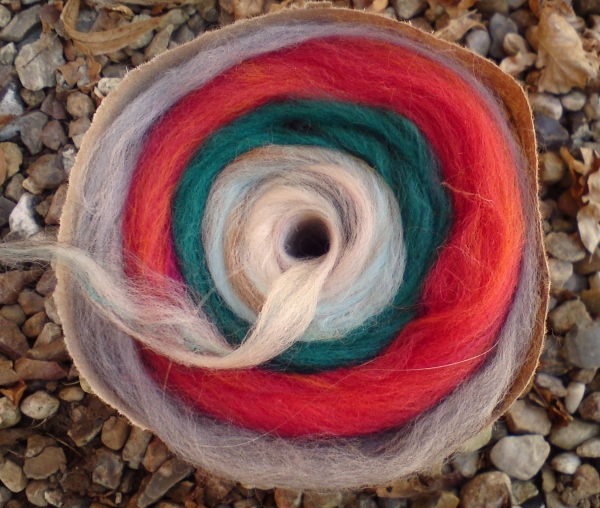 Each fiber wheel holds 200 grams (7 oz) of lovely wool (or other fiber) top, ready to spin or use for feltmaking. Or other stuff.. 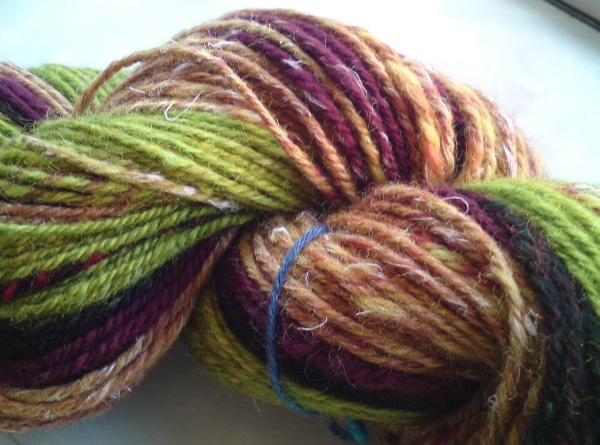 I dye on a variety of fibres. 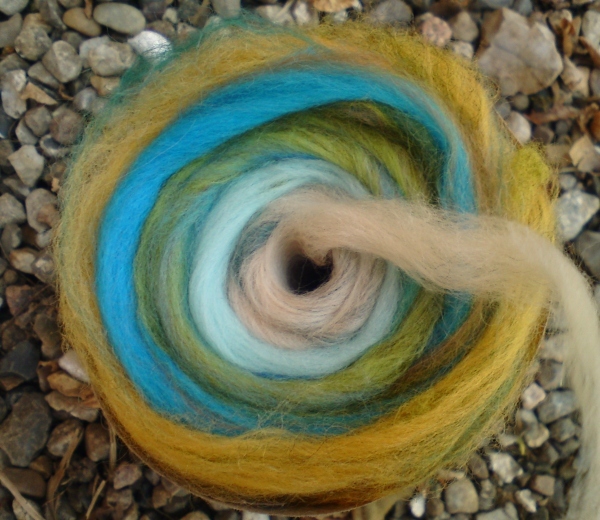 Shetland, falkland, Bluefaced Leicester, merino/bamboo, BFL/silk, polwarth and others. Please check out my shop to see the in-stock list, prices and such. Each bundle of silk hankies consists of 4 hankies, but the weight varies. 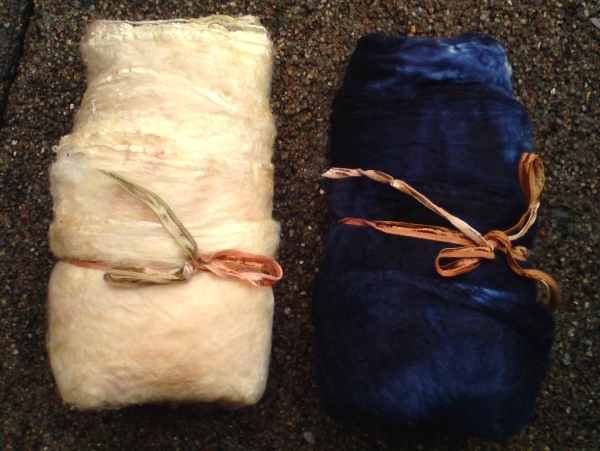 Mostly each bundle weighs from 30 to 40 grams (1 – 1.4 oz). Just ask, and I’ll be happy to weigh it for you and inform about the price. 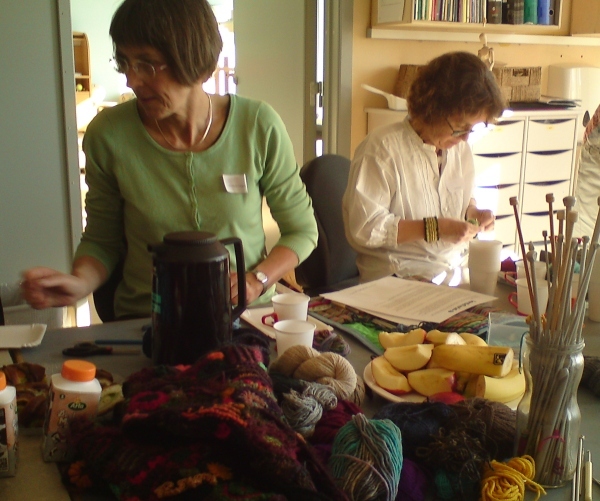 Yesterday I gave a class in Freeform Crochet and Knitting. I have teached this workshop before, but the last time was surely a long time ago, so a little preparation was needed.. 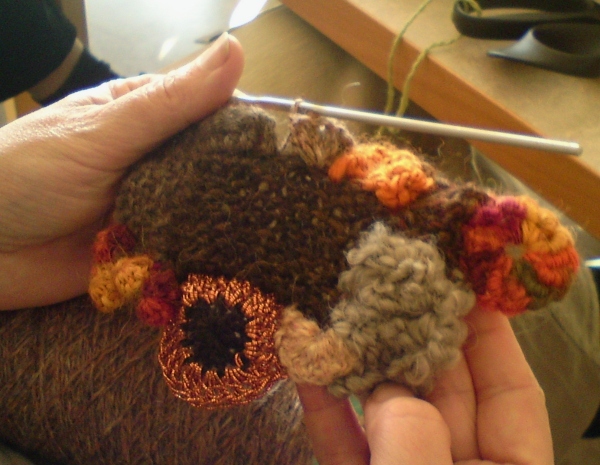 I made this FreeForm scrumble/patch ahead of the workshop, just to get into the groove again. This scrumble contains all the elements that I planned on teaching my students later in the afternoon, and when finished it became a decoration in the neckline of my vest. I had a group of 9 students. 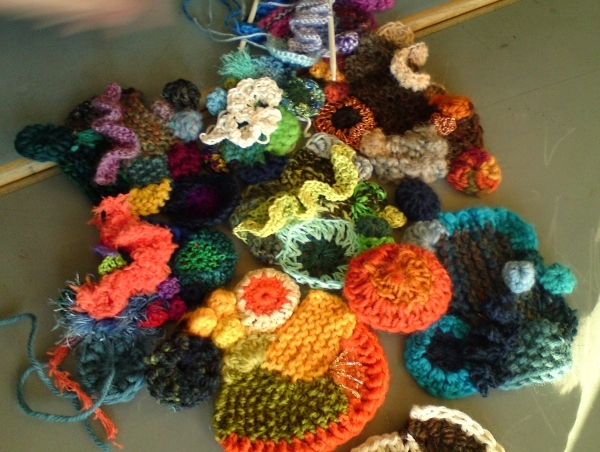 While freeforming was new to them all, they were all skilled knitters, and most of them also good at crochet, so they very easily grabbed the new techniques I presented to them. They were clever students! Concentration was intense. Not much talking. They had no time for breaks: the work continued uninterrupted even though fruit, coffee and cake was served. At the end of the day we gathered all the pretty scrumbles and tried to fit them together. 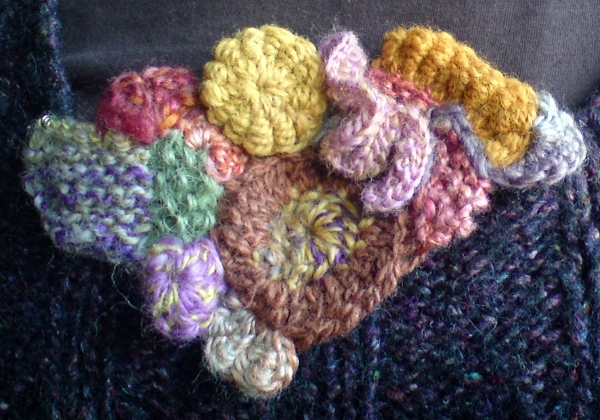 As if by magic they (almost) fitted perfectly together, and even though each student had picked her own pallette of yarn colors we agreed that all the different pieces actually could be used in the same colorfull project – if desired..
Now I have an urge to create some more Freeform (to go with the one I made yesterday). I had forgotten how much fun it actually is! And afterall it is sunday. I actually have the time to dive into it. I’ll do it!